Nigeria's militant Islamist leader Abubakar Shekau may have been killed by the security forces during a shoot-out, an army spokesman has said. An "intelligence report" showed that Shekau, the leader of the Boko Haram group, may have died between 25 July and 3 August, Lt-Col Sagir Musa said. Boko Haram, which has waged an insurgency in Nigeria since 2009, has not commented on the statement. The US had put a bounty of $7m (£4.6m) on Shekau's head. The intelligence report suggested that Shekau was shot on 30 June, when soldiers raided a Boko Haram base at Sambisa Forest in north-eastern Nigeria. If the news of Abubakar Shekau's killing is verified, it could be a significant moment in the life of the group. But even if we take the Nigerian military's word for the events, it is clear that killing Shekau is unlikely to be the end of the violence that has torn the north-east of Nigeria apart. The army has just announced it is taking over what has been a Joint Task Force comprised of all branches of the military and police. "It's not clear that the military know what they're doing," a resident in northern Nigeria told me. He won't believe Shekau is dead until they bring more proof. Is Boko Haram in Nigeria on the back foot? "Shekau was mortally wounded in the encounter and was sneaked into Amitchide - a border community in Cameroon for treatment... 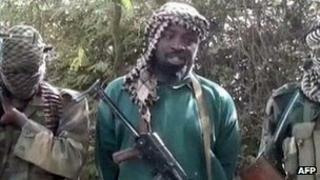 It is greatly believed that Shekau might have died between 25 July to 3 August 2013," Col Musa said. A video of Shekau, released on 13 August, was "dramatised by an imposter to hoodwink the sect members to continue with the terrorism", he added. On 14 August, the military said it had killed Boko Haram's second-in-command, Momodu Bama, also known by his alias "Abu Saad". Correspondents say there is no independent confirmation of Shekau's or Bama's death. Thousands of people have died since Boko Haram began its insurgency in 2009. A claim in 2009 that Shekau had been killed turned out to be untrue, they add. He became leader of Boko Haram after its founder, Muhammad Yusuf, died in police custody in the same year. The insurgency became far more brutal under Shekau's leadership, with Boko Haram carrying out a wave of bombings and abductions, including that of foreigners, in its campaign to create an Islamic state across Nigeria, correspondents say. In May, President Goodluck Jonathan declared an emergency in three north-eastern states, saying the group threatened Nigeria's existence.